Working as a consulting wood scientist for the past 17 years and previously growing shiitake mushrooms as a side project, I often joked that during the day I helped clients (engineers, architects, and lawyers) prevent wood decay or assess damage to materials as a result of wood decay, and on the weekends I intentionally promoted wood decay in an effort to grow shiitake mushrooms. I've been asked to describe wood decay by several clients and friends, so it seems fitting to lump the two together. In this post, I am going to concentrate on wood destroying fungi and the cultivation of shiitake mushrooms. I will discuss the cultivation process for growing shiitakes, how they attack wood, and eventually develop into mushrooms. The cultivation of shiitake mushrooms relates very closely to a lot of the projects that I work on a regular basis at Wood Science Consulting. 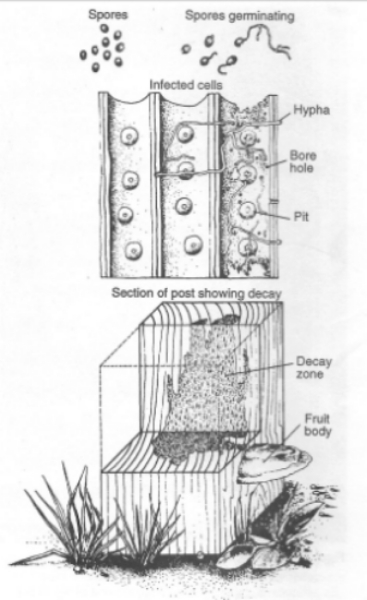 A short and abbreviated description of wood decay starts with spores. Spores are basically microscopic seeds that are emitted from a mushroom. People are often taken aback when they learn that the the air we breathe is filled with all kinds of spores, you just can't see them. Some of those spores are what trigger allergies. When a spore from a wood destroying fungus finds favorable conditions, it will begin to grow. Optimal growth conditions include temperature (60F-105F), moisture content (40% to 80%), atmospheric oxygen, and a substrate. The substrate, in this case, is wood. In the early stages of wood decay spores mature and they develop hyphae which are root-like structures that begin to breakdown wood cells. At this point the decay is only visible microscopically. In this phase of decay, wood strength loss can vary anywhere from 15% to greater than 70%. As the wood decay matures into the intermediate and advanced stages of growth masses of hyphae are often visible as white mats and are referred to as mycelium. At this point in maturity, when the conditions are just right, a mushroom can develop. As the mushroom develops it releases spores into the air and those spores will be dispersed into the environment continuing the cycle. The drilling of shiitake log. The addition of inoculant to the drilled holes. The sealing of the holes with wax. A shiitake mushroom farmer's first step in shiitake production is the collection of freshly-cut logs, typically 4" to 8" in diameter and about 3' long. Species that are commonly used are red oak, white oak, hard maple and soft maple. A series of holes are made in a pattern around the logs and those holes are filled with wood saw dust that is infected with mature shiitake mycelium. This is called inoculant. Once the holes are filled with the shiitake saw dust inoculant, they are sealed with wax. The logs are then left to incubate for several months, allowing the shiitake mycelium to attack the log and mature. This is a phase of wood decay that I described above, and is referred to as early wood decay, or incipient wood decay. Eventually, mycelium will appear on the ends of the logs, indicating that the fungus has spread through the length log. When the mycelium is visible it indicates that the shiitake inoculant has been feeding off the log and has matured into the intermediate to advanced stages of wood decay. At this point the log is ready for shiitake production. After a few years, however, the log will decompose to a point that it will no longer be capable of producing mushrooms because all the nutrients in the log will be consumed. 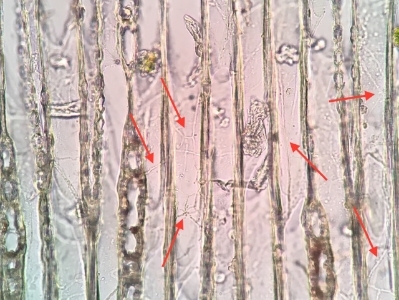 This set of two images are actual photomicrographs taken at Wood Science Consulting showing wood decay hyphae in wood cells similar to the sketch above. This image illustrates the early state of wood decay and was taken from a structural member inside a building. The decay seen likely resulted in significant strength reductions. During the incubation stage of a shiitake log, the wood decay matures as it feeds on the nutrients in the wood cells. As the fungus is growing in the log the development is not obvious to the naked eye. As the maturation process happens shiitake hyphae (the thread-like filaments forming the mycelium of a fungus) are disrupting the cellular structure, effectively reducing the strength of the log. If the log were instead a wooden structural element in a building then this would ultimately affect the integrity of the structural element. The incubation stage of wood decay for a shiitake log is what is often referred to as the incipient, or early stage, of wood decay. During this phase of development, wood strength loss that can again vary from 15% to over 70%. A trained professional is capable of detecting the presence of early wood decay, but samples such as increment cores are often collected and examined microscopically to determine the level and extent of early wood decay present in a structural element. There are three common types of wood decay found in structures: brown rot, white rot and soft rot. Brown rot is often associated with "dry rot" and is brown in appearance; white rot has a white-grey appearance and is generally more common in living trees. Soft rot is a third type of specialized wood decay which I have written about previously, here. Set of logs each fruiting several shiitake mushrooms after a 24 hour soak in water. Once the incubation period of a shiitake log is complete, white mycelium will be visible on the ends of the logs. In a structure, if white mycelium is observed on a wood member, that is generally a sign of significant strength loss and excessive moisture. On the other hand, this is when a shiitake farmer is ready to start mushroom production. By submerging logs in cold water for 24 hours, the log is shocked and the shiitake fungus is essentially provided with the absolute best conditions for encouraging fruiting, the development of mushrooms. There are other types of mushrooms that farmers can cultivate including oyster mushrooms, lion's mane, and even maitake, hen of the woods. Throughout the year, optimal conditions occur naturally in the environment resulting in the fruiting of popular mushrooms such as morels, chanterelles, black trumpets, oysters, lion's mane, and hen of the woods to name of few. In my professional work I have come across fruiting bodies in buildings, like we see in the photo below. While that is favorable for a mushroom farmer, or a forager, it is definitely not favorable for a building owner due to the extensive damage that is likely present. Fruiting body on a glulam beam (Philadelphia Naval Shipyard). One of my jobs at Wood Science Consulting is the identification and assessment of wood decay in structures, and assisting my clients in evaluating the damage. Currently I am only a shiitake mushroom hobbyist, but I still place logs in the stream to promote growth and I even keep an eye on them after a good soaking rain. As a matter of fact, we just has some rain last week and we harvested about 3 pounds of shiitakes. Only problem is that the logs are about 4 years old and are in an advanced stage of wood decay indicating that they will not be producing much in the future.